Amber Kirk-Ford: DISCUSSION: Is It Dishonest to Schedule Posts in Advance? DISCUSSION: Is It Dishonest to Schedule Posts in Advance? Back in December, I excitedly tweeted that I was scheduled up on the blog until March. I've talked before about why I like to schedule my posts - there's less pressure, and if I'm busy elsewhere my blog won't be neglected. Some bloggers don't like to schedule posts and that's fine, but this is the best way for me and it works nicely with my lifestyle. I'd just like to add that I don't always schedule posts, because sometimes life just doesn't work out that way. For example, I don't tend to schedule event recaps, and sometimes if there's a current hot topic going around, like when it was made public that Zoella's book was ghostwritten, I'll publish my thoughts straight away rather than schedule it to go live when it's become old news. However, someone replied to my tweet and said that she hates when posts are written ages in advance and that she couldn't understand why bloggers schedule posts because it "takes away the honesty." I asked why, because I was baffled and because I'd never thought of it that way before. Briefly read over it about a week before it's due to publish. Read over and occasionally tweak it a little bit the day before it's due to be published. See? Even if a post was written ages before it actually goes live, it's still up-to-date because I make sure it is. I don't think it's dishonest - just because I've written a review or a discussion two months before it actually appears publicly on my blog doesn't make it any less genuine. They're still my thoughts and it's still me who wrote it. I never got a reply from the person who thought it to be dishonest, so I'm putting the question to you guys. I'm genuinely interested and I'd love to know your thoughts as it's good to see things from another perspective. Maybe I'm missing something? Do you schedule posts? 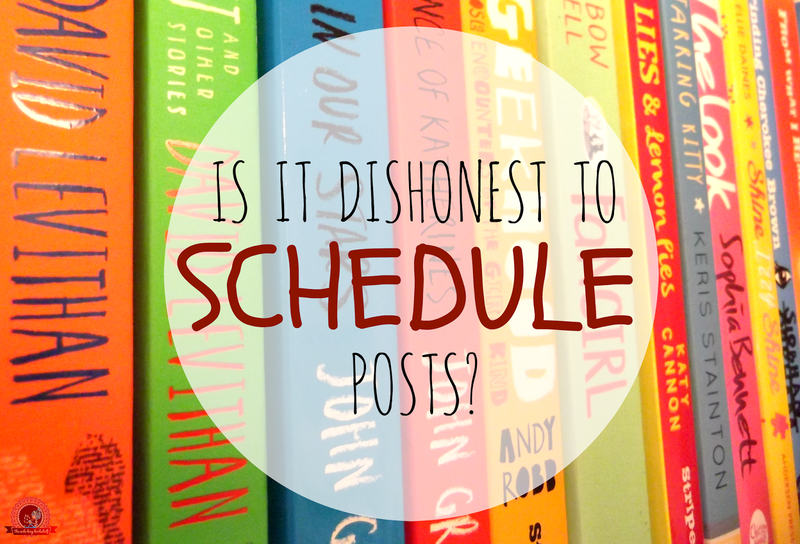 Do you think scheduling posts in advance takes away the honesty? I don't schedule most of my posts because my monthly wrap ups have to be done monthly and unless it's an ARC review I like to post my reviews in the month I read the book. (I usually write the review right away anyways) But I don't think scheduling posts is dishonest at all. Most things aren't going to change in the few months it's queued. I try to write my posts ahead of time and do schedule ahead when I go out of town. I don't see how anyone could possibly think that takes away honesty. I have no idea why this would be dishonest. It's not as if you are saying "I just did this" and it was 2 months ago. I schedule ahead all of the time. I only go a few weeks out. Unless there is time-sensitive information involved in the post, I am going to need more information on the dishonest part before forming any more of an opinion than "I don't get it." I'll schedule them as far ahead as 2 weeks. I'll dedicate a few hours at night to creating content for the upcoming weeks. As a mother of a crazy toddler ,it's what works for me so far. A lot of blogs definitely could not survive without scheduling. Come finals week, who has time to write a post every day? Or if a friend gets sick for a week and you've got to take care of them on top of everything else? Blogging is supposed to be fun, most of the time. And if you've got your week full of posts, then you don't have to worry about it and can move on to other things and be a lot happier than if you're scrambling around to make a last minute post or worried because you haven't posted in a week. (Or years. Whoops.) I definitely envy people that can happily write their posts right when they want to post them and still stay active. I'm actually surprised that people think it's dishonest; I'm curious about why that is too simply because I can't understand it. I often write posts ahead of time - not necessarily schedule them - because I'm just so busy that writing a post on the day it's meant to be published often isn't an option. As well, I like having options when I post, sometimes I don't want to publish a certain post for whatever reason (maybe it needs something extra, etc) so it's handy to have something else to replace it! There are other reasons to schedule posts. For example, I live in Israel but according to AdSense, I get a good deal of traffic from the USA (7-10 hours behind my time). If I post something at a good time for Israel, I have less of a chance of catching my readers abroad. So, scheduling posts to maximize your readership is, I think, okay. To help me with this, I have two blogs - one blogspot and one wordpress. The wordpress one is just a portal for the blogspot one. I usually write and publish my full reviews for my blogspot blog immediately. I then put a snippit of my review on my wordpress blog (with a link to my full one) and schedule that for a time to catch my international readers - usually several days later. Of course, there is one other reason to schedule blog posts - that is if you're writing a review of a book that hasn't been published yet, and the publishers ask you not to put up your review until near or after the publication date. So I see nothing dishonest about scheduling blog posts at all. i wouldn't regard it as being dishonest at all. Other than my monthly book hauls and wrap ups, I schedule nearly all of my posts because it is more convenient than forgetting that something has to be up on a certain day weeks later. I'm currently scheduling everything from April til the end of June for exam season, which means I can focus on my exams instead of blogging for that time. I can't see any possible way that this would be dishonest. I mean, the Blogger isn't suddenly LYING in the post because it's scheduled. The Blogger still means and thinks everything they've written. Wow, what a strange idea that scheduling is dishonest! When I first started blogging I didn't schedule anything and got incredibly stressed trying to keep up with everything. Now I feel so much more relaxed if I know I've got content planned a little way in advance for when life inevitably catches up with me and I don't have time to write posts for a few days. It's still my thoughts about the book or topic, just posted a little while after I initially had them, but like you I always go back to double check and tweak just before it goes live. Great conversation post though! Truth be told, I can see where this person was coming from. When I first found out bloggers scheduled their post, I felt... (for lack of a better word) cheated. 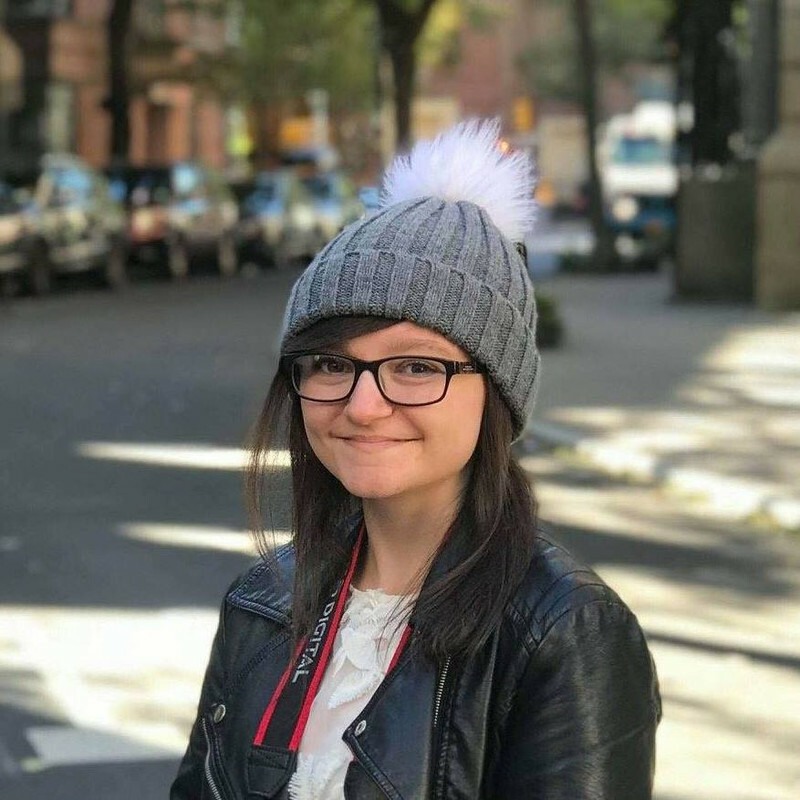 To me, blogging was a state of your current mind. How can something written 3 months in advance be a reflection of that? But the more I thought about it, the more I was convinced that it's not dishonest to schedule. Unless someone is keeping an online journal, it only makes sense to schedule. After all, if one blogs about a specific topic, be it books, design, art, etc, it doesn't really matter when it's published. Discussions and book reviews are thoughts on a subject, which aren't dependent in any way on when a post was written and posted. The concept of a review being dishonest because it's scheduled is bizarre to me. For health reasons I'd be stuffed if I couldn't schedue in advance! If I'm well I post up what I can so when I'm having a bad day I can relax and not bother about having to get a review on time. Scheduling for me is essential when it comes to blog tours, that way they are up from 12am and not waiting for me to write them. Now I use a different approach. I still read the book & do 1-2 sentences...but every Friday, which is when I email my friend the details for the meme post, I write the review part of the review in the word doc, so when I've time/space to schedule reviews it's all there, I just have to add the extra details. Not at all! In fact, it is good blogging practice to have a bunch of posts ready to publish and constantly be working on a backlog of new posts. I work full time, volunteer most nights and I'm training for a marathon - I couldn't run my blog without scheduling! I tend to write all my posts on a weekend for the following week, so it's never too far in advance, but like you, sometimes I have to react to something (or didn't have time at the weekend) so some posts are live straight away. I don't feel it's dishonest - my reviews will be the same, whether scheduled in advance or posted straight away. Admittedly, I do write "today" even if it's written a few days before, but that's for less confusion rather than any dishonesty!!! I've never heard of someone who thought it was dishonest. My impression was that most bloggers schedule posts in advance because it would just be incredibly difficult to, say, consistently write a post every Monday and every Thursday. Also, it would result in a very unbalanced blog: some months I may read 20 books and some months I may read 2. It makes sense to me to distribute those reviews evenly throughout the year. Also, I just don't see why posting a review three weeks after you write it is "dishonest." That's still what you think about the book. Sure, if you reread the book five years from now, you might have a different opinion of it, but I think your thoughts are valid for several weeks at least! This makes about as much sense of saying books are dishonest because an average of three years passes between the time of writing and the time they actually hit shelves. Not all - I don't think it's dishonest. Just practical to schedule posts :) Keep blogging, love your blog! I schedule posts all the time. My blog goes out on Tuesday, but I make sure that by at least Sunday, it's written, and ready to go out. Sometimes it's ready two weeks in advance (although I've never scheduled something further into the future than that). I don't see any problem with it, and I do it for much the same reasons that you do! I would never consider scheduling posts dishonest since it someone's own choice to do what they want with their blog. I personally do a mixture depending on my own schedule as I sporadically do most of my blogging, however some people prefer to have routine schedule on their blogs. I'm all for FREEDOM! I don't see a problem with scheduling posts - and I certainly don't think it takes away the 'freshness'. Just because I scheduled a post doesn't mean I put less time or effort into it. For me scheduling is just a connivence as normally I find I will write two reviews in one go and rather than put them both up at the same time, I can save one for a few days later. I often schedule my posts - unless I'm feeling particularly motivated to the extent that I decide to write a post about a current hot topic. The idea of scheduling being "dishonest" is quite a bizarre concept to me. I mean, it's still written by the individual and still editable between the time of writing and time of publication - what difference does it make? I can't even understand at ALL how this could be dishonest. I schedule posts like Waiting on Wednesday and Flashback Friday ahead of time in bulk because it's easier for me. I schedule reviews as soon as I write them to post on or near the publication date. I don't get how anyone could think it's dishonest, really. I have no problem with it. In fact, I admire those who can schedule. I'm always a mess so mine go live after editing. Very instantaneous process. The honesty's still all there, imo. The only way I can kinda see it her way is if I guess she was referring to the fact that perhaps if the post was written a long while before hand, it may stand a little different today? Like how you perceive the issue now, as opposed to then? Actually you know what, I lost myself. I don't think it's dishonest. I tend to schedule some of mine and other times I don't. It's all a personal preference but if I have a week where I'm not busy with school I'll write multiple posts so I have some when life gets busy again. Also, when you're on holiday it's difficult sometimes to get to the internet so I have to schedule ahead for those times. I'll write, or start to write, some of mine ahead of time whilst it's in my head or perhaps if i'm going to be adding more to it but don't have the information to do it- i.e i'm going to be reviewing books but want to review a couple in one entry then i'll write up the reviews straight after i've read them so they're fresh in my head and don't get muddled with the next book i read, though i don't tend to schedule. not yet anyway. i see nothing wrong with scheduling posts at all, sometimes it needs to be done. if a reader doesn't like scheduled posts, without trying to sound too blunt, but that is their problem I'm afraid. I have to schedule my post in advance! If I don't I fall behind. I found that was the case when I was at school in the spring semester because I let my blog fall away to basically nothing in that time. I don't think that post are dishonest if they are scheduled a head of time. I find it much more convenient for the blogger.